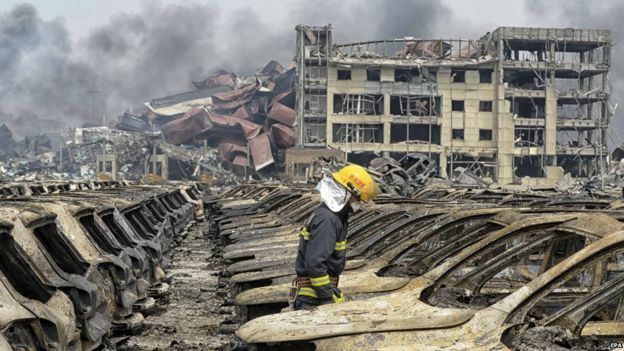 The explosion which occurred in the major Chinese port city of Tianjin, located in the northeast of the country, on the 12th August is estimated to have caused over $1 billion and as much as $1.5 billion of insured losses. At that level of loss there is a likelihood that the global reinsurance industry will bear some of the cost, which could result in some exposure to any insurance-linked securities (ILS) funds or collateralized reinsurance vehicles which underwrite specialty commercial property or marine type risks on a reinsurance or retrocessional basis. Being a port facility some of the losses at Tianjin may be covered under policies that would be covered under a marine reinsurance cover. Other losses will likely be covered by commercial property or specialty reinsurance protections. As a result any ILS players participating could face some impact. However, any impact would likely be minimal, as the region and level of insurance penetration makes China a country where traditional reinsurance players are likely the most exposed. Hence any losses to reinsurance covers would likely be picked up by the big regional and global reinsurance players. 114 people were killed in the explosions, according to Chinese media, with as many as 70 still missing. 17,000 homes were said to have been damaged by the blasts and shock waves. The logistics warehouse which exploded was housing sodium cyanide, hence the area around the site of explosion has now been evacuated which will exacerbate any business interruption claims that are filed as a result of the event. The Tianjin port is the third-largest in the world for cargo transportation and the area is home to major international auto manufacturers import bases, including Hyundai, Toyota, Ford, Nissan, Volkswagen, BMW and Renault, as well as other industries. As a result, there is an expectation that some contingent business interruption claims could grow the overall insurance industry loss figure over time. Reuters reported that Volkswagen had 2,700 cars damaged, most of which will now be unsaleable. Hyundai had 4,000 cars in the area, Renault 5,000 of which 1,500 were confirmed to be damaged. Chinese state media reported at least 8,000 cars worth around $630m were damaged. Major international insurers such as Zurich and Allianz have already said that they will be facing losses from the Tianjin explosion. Credit Suisse said that it also expects some Chinese insurance companies to face losses and that it also expects some reinsurance impact. Meanwhile rating agency Fitch Ratings said that there is a chance that the insured losses from the Tinajin blasts could exceed the $1 billion to $1.5 billion level. According to the China Insurance Regulatory Commission, non-life insurance premiums from Tianjin city amounted to CNY11bn (USD1.7bn) in 2014. As such, should insured losses come in at the high end of the initial USD1-1.5bn estimate, they would represent about 88% of total direct premiums written in Tianjin or roughly 5.4% of aggregated shareholder capital for the six most active issuers at end-2014. In terms of which companies are exposed, Fitch explains that PICC Property and Casualty Company, Ping An Property & Casualty Insurance Company of China, China Pacific Property Insurance, China Continent Property & Casualty Insurance, Sunshine Property & Casualty Insurance and Taiping General Insurance are the most active insurers in the region, accounting for over 77% of the non-life segment on a direct premiums written basis. The losses from the blasts could be shared with both local and international reinsurers, Fitch expects, which will help to mitigate the direct impact on the Chinese insurance sector. While insurers could recover a portion of their property claims from their reinsurers, their exposure, the amount of retention and the number of reinstatements under the catastrophe reinsurance program are likely to determine the degree of severity to which they are affected. Fitch estimates that the overall risk cession ratios of major non-life players active in the Tianjin region range from 10% to 15%. While this event will likely be largely paid for by the traditional insurance and reinsurance industry, the type of reinsurance covers triggered are increasingly finding their way into the ILS space, as fund managers and specialists look to the specialty and marine lines for diversification and expansion. As a result these types of man-made disaster events could become increasingly relevant to the ILS space and its third-party investors in the future. This article updated to add in Fitch Ratings commentary at 09:00 BST 18th Aug 2015.